I have quite a cookbook collection. They’ve overflowed my bookcases and spilled over to both coffee tables. They’re stacked on my desk and sometimes they accompany me to bed. Flipping through the best cookbooks sends my mind into a tizzy and leaves me feeling sort of desperately, overwhelmingly inspired. I want to make everything and it kills me that I don’t have time for all of them. I watched my mom self-publish a few books when I was young, so I know how much effort and care goes into the making of a book. I’m in awe of all the authors who come up with a concept and carry it through to execution. It’s truly a labor of love. Ashley Rodriguez is one of those authors. You may know her work from her beautiful blog, Not Without Salt. She’s a wife and a mother and created a cookbook called Date Night In, which is full of date night-worthy, complete meals to share with another person. I can see how much thought Ashley put into her book. She wove stories throughout and added notes on which elements of the recipe can be prepared in advance. The recipes are worthy of special occasions or just a date night in—they’re a little on the indulgent side, and not many of the meals are meatless, but they all feature fresh, quality ingredients. This salad is rich and outrageously delicious, the perfect accompaniment to many a main dish. I think it would be lovely with my mushroom risotto, roasted ratatouille with spaghetti or just about anything with Italian flavors! Brava to Ashley for a book well done. This vegetarian Caesar salad features a bold sun-dried tomato dressing and Parmesan croutons. 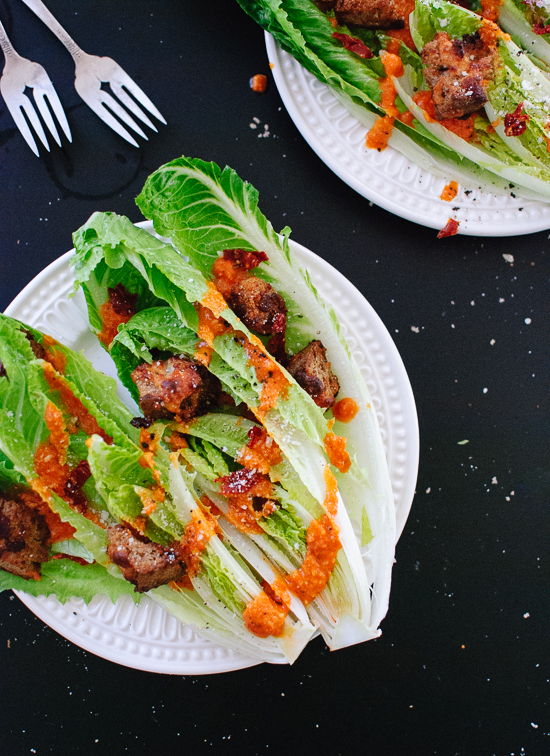 It’s a beautiful spin on traditional Caesar salad. Perfect for date night at home or any meal with Italian flavors! Recipe yields two to four servings. First, a note on sun-dried tomatoes. I’m partial to Trader Joe’s sun-dried tomatoes that come in a bag because they aren’t oily but they’re soft enough to eat right out of the bag. You could also use oil-packed sun-dried tomatoes, rinsed and patted dry. If you’re using tough, dried tomatoes, you’ll need to soak them in boiling water until they’re pliable, then pat them dry and continue with the recipe. To make the croutons, preheat the oven to 400 degrees with a rack in the top of the oven. Line a baking sheet with parchment paper. 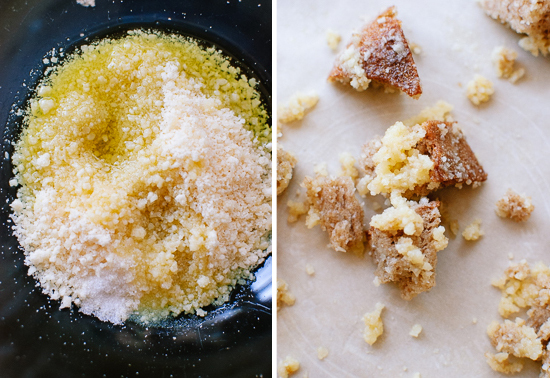 Mix the olive oil, Parmesan and salt in a large mixing bowl until a paste is formed. Add the cubed bread and mix well with a spatula, until all the bread is coated. Turn the bread onto the prepared baking sheet and arrange in a single layer. I couldn’t quite mix in all of my Parmesan mixture, so I sort of lumped the excess on top of the bread pieces. Bake for 10 minutes, then stir and put the croutons back into the oven until they are golden brown and crisp, up to 5 more minutes. 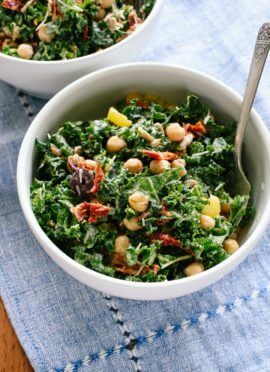 To make the dressing, combine the sun-dried tomatoes, Parmesan, lemon juice, water, garlic and a pinch of salt in a food processor or high-powered blender. Process for 1 minute, stopping to scrape down the sides if necessary. While running the machine, drizzle in the olive oil and blend for 10 more seconds. Don’t worry if it’s not perfectly smooth; it will still taste delicious! Taste and add more salt and some black pepper, if desired. Set aside. 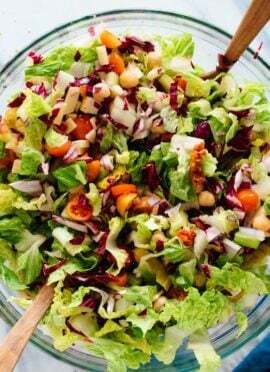 To assemble the salad, drizzle the dressing over your halved romaine or toss with your chopped romaine. Finish with croutons and a sprinkle of Parmesan and sun-dried tomatoes. Serve immediately. Recipe minimally adapted from Date Night In by Ashley Rodriguez. Storage suggestions: Dressing will keep in the refrigerator for up to 1 week. If it separates, whisk vigorously before serving. Gah, this is so pretty! 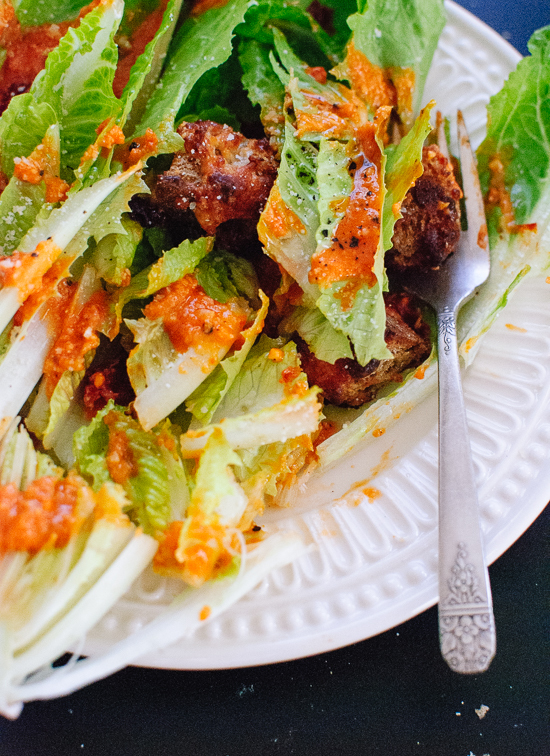 I have a bag of sun dried tomatoes that I need to use and this salad is just the thing. Thanks for sharing. I love Ashley’s recipes! Thanks, Nicole! I’m with you on Ashley’s recipes. Hope you’re well! What a great recipe – love the flavors – I have hundreds of cookbooks too – I wish I had the time (and energy) to cook everything! I am obsessed with sun-dried tomatoes right now. (I love them in a variation of your roasted cauliflower & farro salad) I can’t way to try them in this cesar dressing! I adore Ashley’s book -so cute and full of delicious recipes! 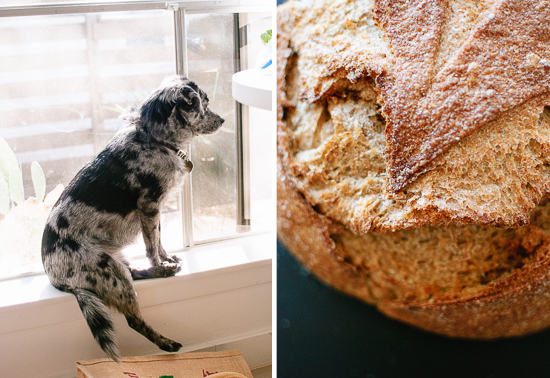 Love the way you’ve photographed this – yum! I saw the promo video for Ashley’s book and it was so sweet! I didn’t buy it because I had just bought a few others but I definitely want to get it soon. It sounds awesome! And I’m so thankful for Whole Food’s vegetarian cheeses. It would be slim pickins if it wasn’t for them! I knew I couldn’t be the only one reading cookbooks in bed. I’ve been wanting to check out Ashley’s book, so thanks for the preview! 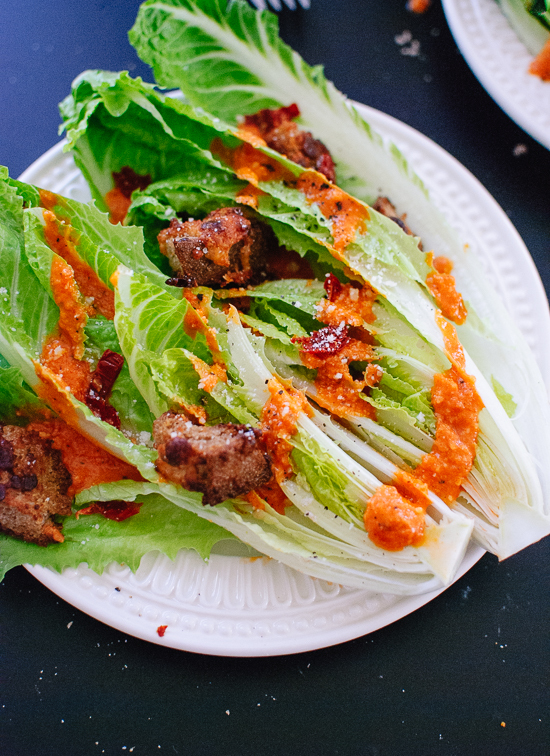 This looks so light and crunchy, love the idea of sun dried tomato dressing. Fab! 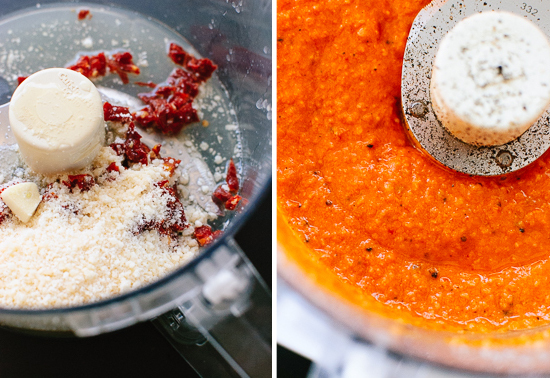 This dressing sounds so good — and what a beautiful, intense color! 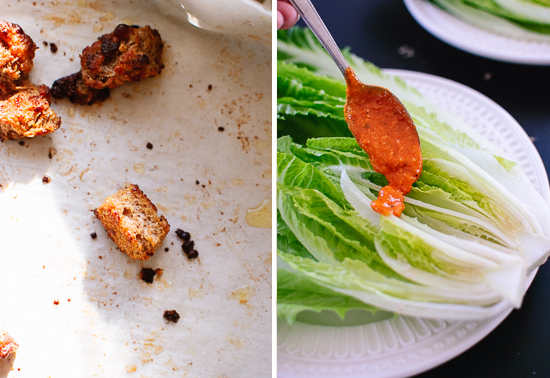 I bet the rich sweetness of sun-dried tomato is perfect with crispy romaine. Looking forward to trying the recipe. Even as a long time non-meat eater, I look the other way, avoiding the fact that rennet is used to make cheese. Oh and I do love cheese. That looks so tasty right now! 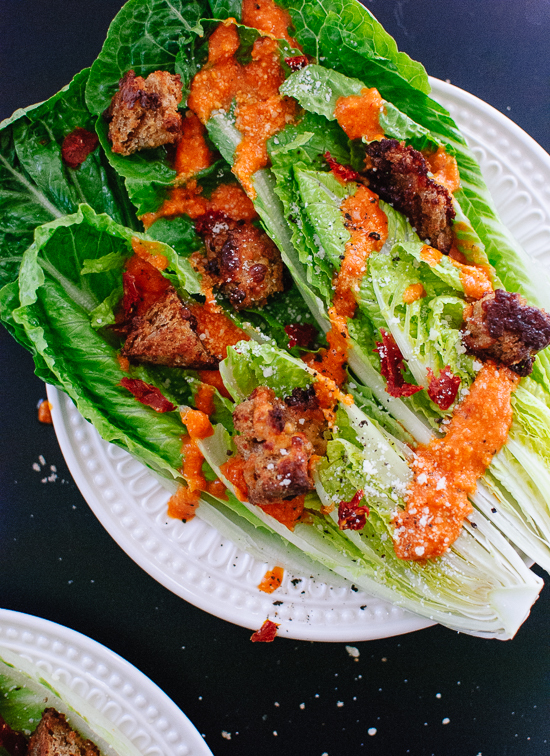 This looks so great – I love caesar salads and I’m digging the unique sun dried tomato dressing :) The homemade croutons look great too! Beautiful Caesar, great idea! Pecorino Romano would probably also be delicious (in place of Parmesan). I’m absolutely obsessed with Ashley’s book. I’ve read it once all the way through and have gone back to read passages again. It’s sitting on my bookshelf in my dining room. I suspect it’ll be taken out frequently for inspiration. Speaking of inspiring… this Caesar is blowing my mind. 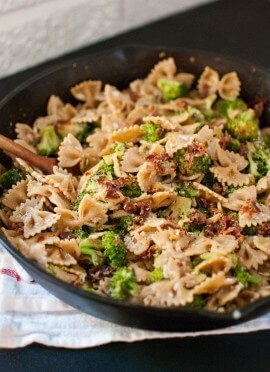 What a wonderful way to use sun dried tomatoes! I haven’t had a Caesar salad since I turned vegetarian four years ago! The old style just seemed kind of bleh when you take out the dressing, bacon, and croutons (gluten free too) – but this, this, is a Caesar salad to get excited about! Flavoursome dressing, croutons that I can make from gf bread, and crunchy lettuce. I can’t wait to make this! Oh, and I love Ashley’s website too. Just beautiful. Thanks, Amy! I’ve opted for the more colorful, vegetarian salads since I gave up chicken, but you’re right—this Caesar salad is something! Hope you love it. I think that your recipes are great, however there is one caveat. Parmesan is not, and never has been, vegetarian. It is made using rennet. Hey Marc, I addressed this in my post. Whole Foods and a couple of other brands offer vegetarian Parmesan made with vegetable rennet. I appreciate your recipe. I will try it. I’m just loving Date Night In (even as a single gal!). It is beautifully written and I want to make everything in the book. Gorgeous photos, Kate! I have similar feelings towards my cookbook collection. So many, so much good, so little time/stomach space, but I want to eat it all! Love this recipe Kathryne. Will you be my Valentine? That sun-dried tomato dressing looks killer and I love the parmesan-crusted croutons! The dressing sounds delicious – can’t wait to give it a go! That dressing! Can’t wait to make this wonderful looking salad. I don’t ask about cheeses either…honestly, I don’t even really believe that the people who are cooking with them in restaurants have any idea anyway…so I might as well just take an ignorance is bliss attitude towards it. Pretty sure I would choose this dressing over the regular Caesar any day! Yep, I’m with you! Too bad we live too far away to go get some pizza together! Tried this last night it was DELICIOUS and SO EASY! On my lunchtime favorite list. Thanks Kate! Thank you, Sara! So glad you’re enjoying my recipes. Thank you for sharing them with your friends, too! I have now made five dishes from this website and have never been disappointed! I made this salad along with the Spinach Artichoke Lasagna and everybody raved about both. This caesar dressing is so good, I could eat it everyday with everything. I will definitely make this again. Thanks again Kate for a winner of a recipe! Woohoo! That’s so nice to hear. Thank you, Karen! Hey! I loved the idea of this recipe however I thought I should mention that parmesan cheese is not vegetarian. All parmesan cheese uses rennet otherwise it wouldn’t be parmesan. Hi Biscuit, that’s a good point, but Whole Foods sells Parmesan that is free of animal rennet. I think they use microbial rennet instead. Bel Gioso also makes a vegetarian parmesan. This salad is my new fave!! It’s amazing!! I even have the Date Night In cookbook and somehow this recipe slipped by me. I’m glad you found it on my site! Thanks, Ashley! Thank you, Ashley! I did the nutrition information for the entire recipe. I didn’t break it down for each component. Sorry!